We packed lunch in our yumbox again today. This lunch is for my first grader who eats very little for lunch. He chose all the different foods himself and because I know that he will eat a warm snack once he is home I let him choose snacky foods today. He chose popcorn, Berry Blossoms cereal from Kashi, a cereal bar, two mini grape jelly sandwiches and mini peppers cut up. I found these cute mini cookie cutters on Amazon and I love how they came out! Hey wow there is so much cool stuff on amazon in de USA..
Love the little sandwiches! So cute! 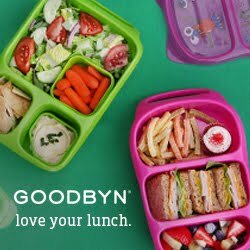 Both lunches are very cute and I am so jealous of your Yumbox! Thank you for linking up!